Since the last post, I have been busy continuing with laying track in the Down storage yard, but this has now come to a temporary halt. A week or so ago saw the failure of my shear tool that I use for cutting the PCB sleepers, so until I work out how to repair it, I’ve started on the next section of benchwork from the storage yards to Kankool. Over the past few weeks, I’ve been doing a lot of thinking about how to go about the construction of this benchwork, and have been reading some books etc. I have settled on using steel shelving brackets to support L-girder benchwork. 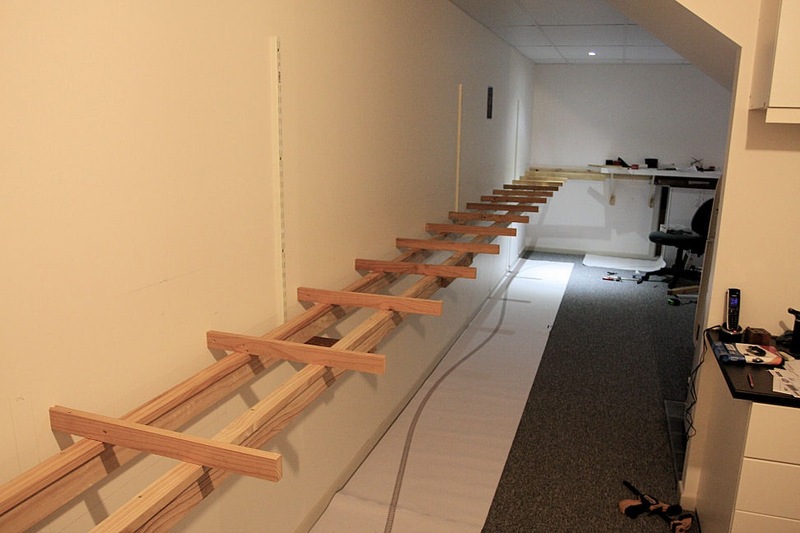 Late last week I had worked out what I required for a few sections of future benchwork, and ordered the parts on-line from The Shelving Shop, in particular their Twin Track system. 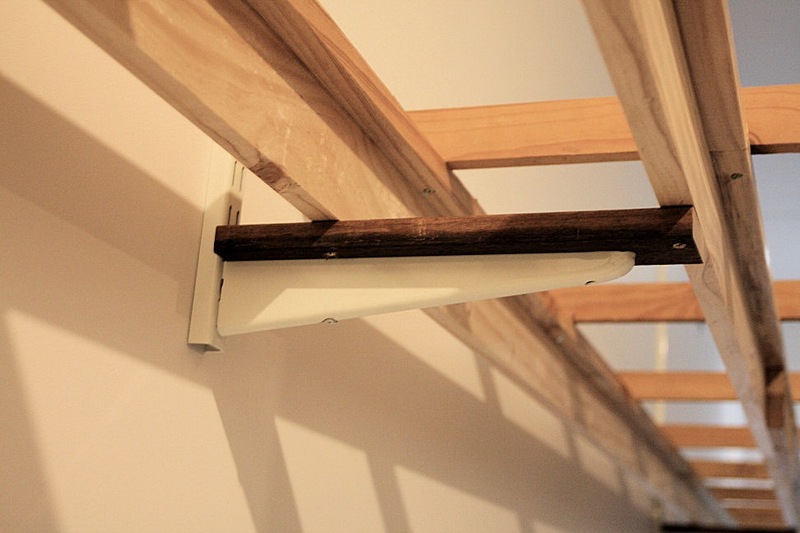 I looked at obtaining the shelving system locally, but I saved around $70 by getting it on-line. That’s including postage! The pictures above show where I got to today with the L-girders attached to the brackets and the joists atop the girders. The girders are made from 3×1 and 2×1 DAR pine. The maximum span I can have with this size girder is around 9’ 6”, so the shelving uprights were located along the wall well within these limits. The joists are 2×1 spaced at 500mm intervals. The future track height at the far end of the left hand picture is around 4.5” above the top of the joists rising to around 7” by the time it reaches the end of this run. This will allow for plenty of room below track level for scenery. The top of the joists are 38” above floor level. As can be seen, this section will only be narrow, as I have to allow for enough aisle width to be able to get under the stairs. The joists have been cut at 500mm from the wall, but this can always be shortened to suit the future scenery valance. The paper that’s visible on the floor is a full size printout of this section of the layout from my 3rdPlanit drawing. It will be used when setting out the spline roadbed, and could be subject to change as things progress, but will be pretty close to the original plan. So, the next part is to begin construction of some spline roadbed. I’m eager to try this and looking forward to it. Watch this space! Posted on Sep 27, 2011, in Benchwork and tagged L-girder benchwork. Bookmark the permalink. 2 Comments. What a Fantastic Job! This is my favorite way to build Bench work. Thanks for the comment. I have, however, re-designed this section of benchwork and done away with the shelf brackets. See this post.